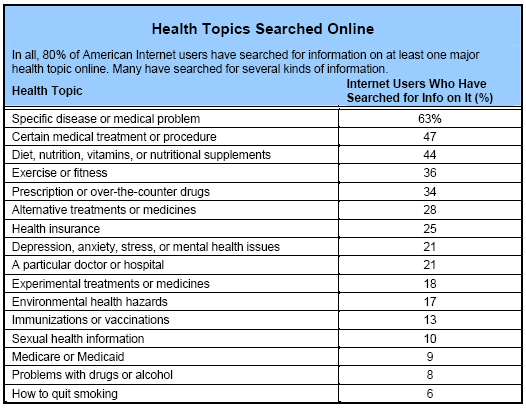 Half of American adults have searched online for health information. Fully 80% of adult Internet users, or about 93 million Americans, have searched for at least one of 16 major health topics online. This makes the act of looking for health or medical information one of the most popular activities online, after email (93%) and researching a product or service before buying it (83%). Our finding represents a substantial enlargement of the population we have called online “health seekers” in the past. Previously, we have reported that 62% of Internet users said “yes” when we asked if they look for health or medical information online. For the first time, we prompt respondents with questions about specific health topics, to give a fuller portrait of what Americans are looking for online. Not surprisingly, the number of health seekers increased when we asked Internet users more specific questions. Health seekers go online to become informed, to prepare for appointments and surgery, to share information, and to seek and provide support. We conducted an online canvassing of Internet users to find out in more detail the kinds of things they do online and the impact it has on their health care. From the nearly 2,000 responses we received, we can construct a detailed portrait of the many kinds of activities health seekers do online. Search for health information at any time of the day or night. Research a diagnosis or prescription. Prepare for surgery or find out how best to recover from one. Get tips from other caregivers and e-patients about dealing with a particular symptom. Give and receive emotional support. Keep family and friends informed of a loved one’s condition. Find humor and even joy in a bad situation. Women are the primary consumers of online health information. Women are more likely than men to seek health care and health information, so it is no surprise that they lead the way with Internet health. Some 85% of online women have searched for at least one of these 16 health topics, compared to 75% of men. Wired women are also considerably more likely than wired men to have sought information on multiple health topics. Health searches are not an everyday thing for most Internet users. Although very large numbers of Internet users conduct health searches, most do so infrequently. Eight out of ten of those who have conducted health searches say they do so every few months or less frequently than that. Indeed, on a typical day, just 6% of Internet users look for health or medical information online (by contrast, 49% use email, 19% research a product or service, and 5% buy a product online). More than half of those who recently conducted searches did so on behalf of someone else — a spouse, child, friend, or other loved one — not for themselves. Internet users find support in online groups and email. In addition to information searches, Internet users are increasingly going to disease- or situation-specific support sites and using email to discuss health issues with family, friends, and (to a lesser degree) doctors. More than half (54%) of Internet users, or about 63 million Americans, have visited a Web site that provides information or support for people interested in a specific medical condition or personal situation. About a third (30%) of email users, or about 32 million Americans, have exchanged health-related email with friends, family members, and doctors. At this point, only a small portion of patients communicate with their doctors online, but those online survey respondents who do say email streamlines tasks like scheduling prescription refills and follow-up appointments. Health seekers report that their health information and services improve and that their relationships with their doctors change. Internet users report two effects of online health resources: better health information and services, and different (but not always better) relationships with their doctors. Three-quarters (73%) of health seekers say the Internet has improved the health information and services they receive. Some online survey respondents say that doctors are receptive to Internet research; others are cautioned to avoid any online health information. Health seekers want access to more information, but they can’t always find what is already available online. Are You Impatient for Doctor-Patient Email?